As a THANK YOU for purchasing my new book, I will autograph and/or inscribe a personal message for free! If you are ordering more than one book and want unique messages in each one, add each book to the cart one at a time so you can customize each message separately. You can then check all the books out at one time. Please write exactly how you would like the message to appear in your book. 15 word limit, please. The Bible is for you. All 66 books of the Bible are God’s legacy, passed onto you. All you need to do is read and listen for God’s voice telling you what you need to hear. This incredible anthology is designed to be read in your way at your pace. Each book of the Bible is summarized and its teachings are presented as devotions to witness the carefully crafted messages that God is revealing Himself to you. God’s word has never failed anyone, you just have to be receptive to hearing it. Journey Through The Bible is not just a book title. It is a call-to-action inviting you to stop and breathe in the life He is presenting to you every day. Order your copy today and receive an Ivey Rorie personalized autographed copy. Free bookmark for the first 500 copies sold! * Books that have been personalized may NOT be returned. We have the right to edit and/or refuse any message we deem inappropriate. 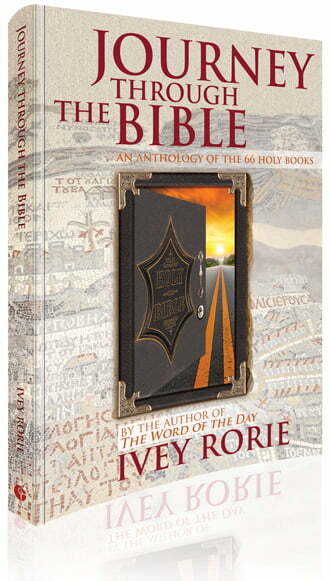 Ivey Rorie has done it again with an insightful look into all the books of the Bible! She is a truly anointed writer with a wonderful way of applying the Word of God to my every day life situations – right on my level. I highly recommend this book to anyone who wants to learn more about God’s Word, grow in their walk with the Father, and find practical applications to apply God’s Word in every area of your life. What a resource for the soul. We know that scholars will tell you what a passage of scripture is intended to mean, and what it is meant to say to humanity. However, we often lose sight that scripture speaks to us in different ways when applied to our life’s journey. Ivey, in most cases, draws attention to verses that remain obscure to many of us as travelers through the Bible. And doing so, she opens herself up to how God has touched and continues to touch her. It is a rare window when we are afforded opportunities such as this in life. I enjoy being able to just randomly open the devotional to any point in the book and to be enlightened and blessed through someone else’s journey.